The “Non-Technical Summary of the Environmental Statement” (Volume 6, document 6.1) – the “NTS” is a 40-page, illustrated summary of the Environmental Impact Assessment (EIA) process and results (reported in full in the accompanying Environmental Statement, ES). The NTS starts with an introduction to the Project and its operation, the consenting process, and a description of access and design matters. The document then summarises the potential effects of the Project on the local and wider environment, as well as measures to reduce effects and provide benefits. The NTS is provided in English and Welsh and is a great starting point for all readers. The “Design and Access Statement” ( Volume 8, document 8.1 ) – the “DAS” records and illustrates the design principles, rationale, process and final Project design. It shows how the Project design has responded to consultation, as well as to operational requirements, viability analysis, technical engineering, and the EIA process. The DAS starts with a 7-page summary (provided in English and Welsh) and includes multiple images, plans and maps to show readers how the Project will look and work ‘on-the-ground’ for its future staff and visitors alike. The “Consultation Report” ( Volume 5, document 5.1 ) – this explains how TLSB has consulted statutory and non-statutory consultees, land owners, stakeholders and the public (in line with legal requirements and best practice). It shows how TLSB has “had regard” (or responded) to the consultation. The “Planning Statement” ( Volume 8, document 8.2 ) – this sets out the relevant planning considerations relating to the Project. It describes the context of the scheme including its surroundings, the planning history of the site and other local features. The Project is then assessed against relevant national and local policy (including the UK’s urgent need for new, renewable energy generating capacity) to demonstrate to the decision maker (the Secretary of State for Energy and Climate Change) how the Project accords with policy at all levels. Finally, for readers who want to see what the Project would look like once completed, please refer again to the DAS (described above, Volume 8, document 8.1 ), and the visually-verified (accurate and to-scale), computer-generated, photo montages provided from viewpoints all around Swansea Bay in Figures 13.20 to 13.77 of the ES (Volume 6, document 6.3), and in our interactive map here . This layman’s guide is repeated, with a graphic showing the entire document structure, in Volume 1, document 1.4 . 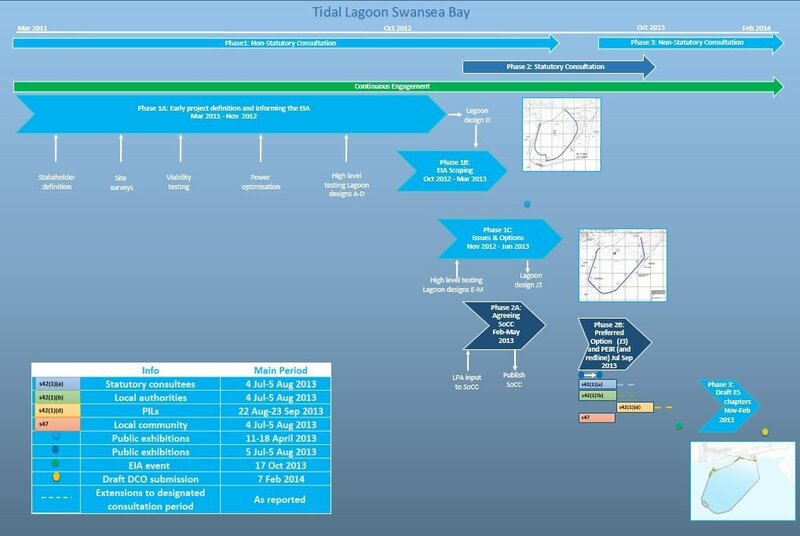 All of the Application documents, plans and maps are provided below and on the Planning Inspectorate’s website , where all representations about the Lagoon will also be published.